Maine and South Carolina Republicans against NSA snooping. 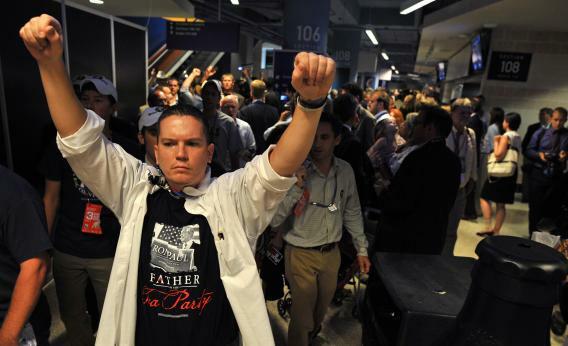 Maine delegates chanted, “As Maine goes, so goes the nation” after they staged a walkout during the Republican National Convention in Tampa, Florida on August 29, 2012. Twelve members of the Maine Republican party are binning their membership cards after a year of internal strife with the state and national GOP. Let’s travel in the Way-Back Machine to August 2012 at the Republican National Convention in Tampa, Florida. Twenty delegates from Maine—many of them Ron Paul supporters—were supposed to cast their ballots at the national convention. But when they arrived and RNC organizers sussed out the Mainers’ plan to vote for Paul instead of Mitt Romney, the organizers made some last-minute rules changes and replaced the Paul supporters with other delegates. The Maine delegates were not seated—which led to more controlled chaos, when the angry ousted delegates and their friends marched from the cheap seats to the convention’s halls, holding a furious impromptu press conference. Some of them wore lobster-decorated safety pins on their noses. That looked as good as it sounds. For Sam Canders, one of the Maine delegates who was refused a seat, this was strike one against the GOP. Strike two came when he tried to run for the Maine state legislature and was told by his state GOP chair that the GOP wouldn’t support him, even though they didn’t have an alternate candidate to offer. Instead, the chair asked Canders to run as a placeholder candidate and drop out when the GOP found another candidate to their liking. Strike three came for Canders after the RNC’s national meeting in Boston last week, when members upheld three rules that allowed the party to keep upstart delegates from participating in the convention. In Senator Graham’s world, government should always be trusted but never the American citizen. In Senator Graham’s world, the Constitution doesn’t exist. In Senator Graham’s world, the entire Bill of Rights is negotiable. In Senator Graham’s world, our constitutional rights seem constantly up for debate. The difference between these two states is, of course, their partisan tint: Maine voted for Barack Obama over Romney 56-41 percent; South Carolina voted Romney 54-44. But the room for discontent with the GOP has no partisan bounds.